Dine surrounded by beautiful Belle Epoque artistry, savor the food and wine, and dream of what the french call the "golden age." Le Train Bleu is a best kept secret. Even most parisien's won't share. Paris was cold and grey. Rain had begun to cover the sidewalk as we left our hotel heading for the train station. I couldn't wait to step inside the magnificent restaurant wondering how Woody Allen could have missed this experience before Midnight in Paris. Softboiled organic egg on a bed of panfried creamed morel mushrooms 20€. We couldn't resist the roast leg of lamb, potatoes au gratin with Fourme d 'Ambert cheese 34€ and for desert vintage rum baba with whipped cream. This calls for a celebration! Any to be exact. Dining at one of the most historical restaurants in Paris is divine. Le Train Bleu is a museum. It was built to celebrate the Universal Exhibition in 1900 by the Paris-Lyon-Mediterranean (PLM) Company. 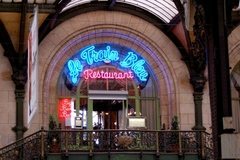 Originally called, "Buffet de la Gare de Lyon" (Lyon Station Buffet), it was renamed "Le Train Bleu" in 1963, in tribute to the celebrated "Paris-Vintimiglia" service, then granted historical monument status in 1972 by André Malraux. The establishment also owes its renown to the forty-one paintings on its walls and ceilings - the most famous amongst them represent the landscapes traversed by the trains of the PLM network. Since its inauguration by Emile Loubet, the President of the French Republic, on 7th April 1901, customers have been flocking to the restaurant. Regulars have included Coco Chanel, Brigitte Bardot, Jean Cocteau, Salvador Dali and Jean Gabin. We experienced one of the best meals in celebration of Jim's 70th birthday. Come dine with us in Paris tonight and tomorrow we will travel to Burgundy. Explore Burgundy4U in France in our upcoming series. Meet Frances and Benjamin Haas at their beautiful farm and learn how you can rent this magical home near the quaint village of Baume.